All 14 to 16-year-olds should be able to study a vocational subject at school – and colleges could hold the key to providing that offer, an influential group of politicians and sector leaders recommended today. The Demos thinktank’s Commission on Apprenticeships, launched last summer, has published its report, which also calls for an “apprentice guarantee” that could see learners liable for off-the-job training costs if they don’t complete their framework. The 11-member commission includes co-chairs Conservative MP Robert Halfon and Labour peer Lord Maurice Glasman, Mike Cherry, national policy chairman at the Federation of Small Businesses, Kirstie Donnelly, UK managing director of City & Guilds, Steve Radley, Construction Industry Training Board director of policy, and Stewart Segal, Association of Employment and Learning Providers chief executive. 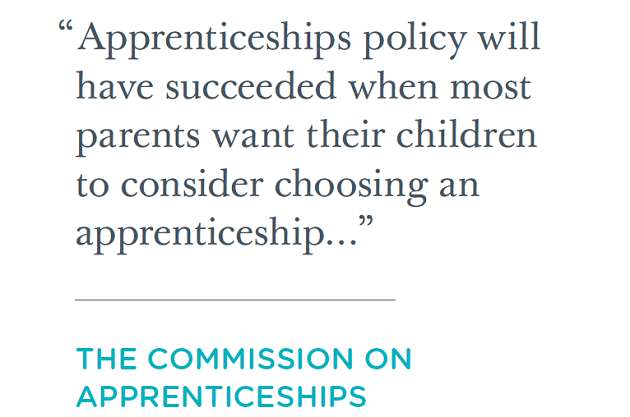 The Commission has made its recommendations in the 116-page report alongside the results of a survey of 1,000 parents, which revealed a big difference in the proportion who thought apprenticeships were a good option for young people generally (92 per cent), and those who favoured them for their own children (32 per cent). As well as calling for vocational options to be offered to school pupils, the report also welcomes the “direction” of apprenticeship funding reforms, but calls into question government plans to route funding through employers. The report says: “All students aged 14 to 16 should be offered the chance to take a vocational subject alongside academic study. This would not be compulsory but the option should be available to all. On funding reform, the report calls on the government to “either revert to one of its earlier policy options, such as the provider payment model, or offer each business a choice as to whether they directly handle public money or not”. It adds: “The government should trial a new ‘mutual guarantee’ arrangement at the start of an apprenticeship, as part of an apprenticeship agreement. Other recommendations include face-to-face support from the National Careers Service and an apprenticeship charter for employers who demonstrate commitment to high quality training. The report also calls for better use of destination data. Commission co-chair Lord Glasman said: “This report shows that we have a long way to go before the skill and character required to complete a quality apprenticeship are fully recognised in Britain. On a good day I think “this is all good stuff-progress at last!” On a bad day I think “these are the same points and arguments I-and a few others- was making 20 years ago. Are we really making progress? Well yes, but only at the snail pace permitted by the academic community”.